Egypt was once called the "gift of the Nile" by the ancient Greek historian Herodotus. But today, more than 2,000 years later, Egyptians fret about the existential threat of a faraway dam to their water supply. Nearly seven years after Ethiopia began construction of the Renaissance Dam on the Nile River, downstream neighbors Egypt and Sudan worry about the structure's impact on the river's water levels and potential harm to agriculture and industry. Negotiations to reach a solution continue, but no agreement is in sight. Ethiopia began building the Renaissance Dam in 2011, as Egypt was engulfed in political turmoil. As the dam nears completion, Egypt's leaders are considering ways to cut back on water consumption. Government officials fear the dam will reduce their country's share of Nile water allocated to it under a 1929 international accord. During a visit to the Ethiopian capital, Addis Ababa, in 2015, Egyptian President Abdel Fattah el-Sissi tried to appear conciliatory. But his worry was clear. He told his hosts that he was happy that the dam would bring "development and growth" to their country, but warned them that "the Egyptian people rely entirely on the water that comes from [the Nile]." Guy Jobbins, a water research fellow at the British Overseas Development Institute, told VOA that Egypt's concern is well-placed. "The Nile is to all intents and purposes Egypt's only significant water supplier," he said. "It supplies about 99 percent of the water that Egypt uses each year," a reliance he said makes it "extremely vulnerable to anything that influences that flow of water." Jobbins pointed out that water desalinization was "becoming more of a viable option in the Middle East," and that prices "are becoming cheaper." But he stressed it was expensive, and "with 100 million people living in Egypt, the cost of supplying more water by desalinization would be exorbitant." 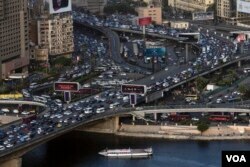 Jobbins calculated that the needed infrastructure could cost Egypt around $3 trillion. No one is certain how much Ethiopia's Renaissance Dam will affect Egypt's agriculture, or life in general. The completion of Egypt's own Aswan High Dam in 1971 with the help of the former Soviet Union disrupted the normal flow of the Nile, reducing the amount of silt carried downstream and the vital nutrients it once provided to Sudan's and Egypt's fertile agricultural lands. Some experts worry the new Ethiopian dam could also increase the concentration of agricultural and industrial pollutants if the flow of river water decreases. Jobbins noted that the agricultural regions of Egypt's Nile Delta in the north traditionally rely on "the river's ability to flush [pollutants from] these places into the sea." The issue of long-term water quality, Jobbins argued, becomes more acute if the amount of water flowing into Egypt from the Nile is reduced. Egyptian Foreign Minister Sameh Shoukri met with Ethiopian and Sudanese officials at an African Union summit in Addis Ababa in late January. Earlier this month, Ethiopia's Prime Minister Hailemariam Desalegn, who recently resigned, told Sissi during a visit to Cairo that the Nile must "provide an opportunity for cooperation" and "never become a source of competition, mistrust or conflict." 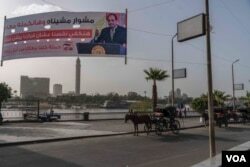 Sissi agreed, saying the river should "not be a source of conflict." Veteran Egyptian editor and publisher Hisham Kassem said a key potential conflict hinges on whether Ethiopia will fill the reservoir behind the new Renaissance Dam over 12 years, or over just three, which could severely curtail the flow of Nile water to Egypt in the interim. Kassem thinks the talks are "stalled," and said "if no deal is reached, [the situation] could be catastrophic, because it could mean that a lot of existing agricultural land in Egypt will be [left without] water, and the drought will have a serious impact on it." Former Egyptian President Hosni Mubarak, ousted in 2011, told Egyptian media last year that he would have taken action to destroy any dam Ethiopia built on the Nile. 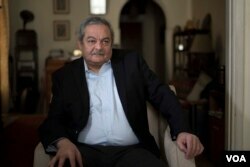 Kassem believes military action to resolve a dam dispute would not be a good option, especially in the longer term. "If there's a diplomatic failure, and Egypt resorts to military force, it's going to be the biggest diplomatic failure in the history of Egypt," he said. "And it's going to affect Egypt's ability to acquire arms." In the meantime, Sissi insists there is no crisis, while diplomats continue to talk.